Student, Meet Thesaurus Linguae Graecae. 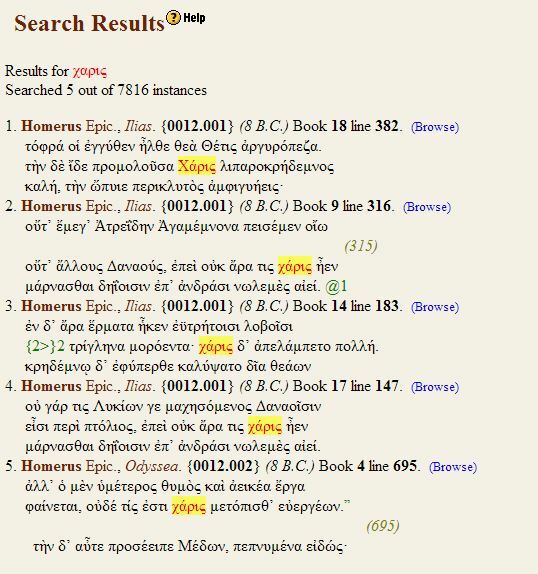 Thesaurus Linguae Graecae (TLG) is an online database of Greek texts stretching from Homer and reaching through to the Septuagint, New Testament, and early church leaders. Using TLG, you can perform various types of searches that prove useful in word studies and exegesis. In fact, many TEDS students are required to use TLG in New Testament exegesis courses. Significant benefits of using TLG in word studies include access to more comprehensive data and the ability to perform diachronic word studies in addition to synchronic word studies, e.g., limited solely to the New Testament’s use of a certain word. You can access TLG at three computers in Rolfing Library: the two computers across from the reference desk and the computer across from the scanning station, next to the microfilm reader. Once in TLG, you can perform searches by author, date, source, word (and lemma), or a combinations of these. And within lemma searches, you can even specify the search according to morphology (exciting, I know!). Many students use the LOEB Classical Library in conjunction with their findings. With the locations provided by TLG (e.g., book and line), you can easily locate these passages in the appropriate LOEB work. The LOEB collection can be found in the reference section (Ref. PA3611 .A14 1931 — Ref. PA 6156 .V6 A26x 2000). Rolfing’s website also contains helpful tutorials for using TLG. And if you need further personal assistance, just come visit us over at reference! We’d be glad to help! Kirk Miller is a Reference Assistant at Rolfing Library. You can contact Kirk and our entire reference staff at libref@tiu.edu.